Jimmy Santiago Baca had a story to tell me. Coming from Jimmy Baca, his answer hadn’t surprised me. Read about Jimmy Santiago Baca’s visit to Siouxland and how he hopes to help troubled youth. To the thousands of children and illiterate adults Baca helps each year, however, it isn’t just a job. It’s a second chance. Often, a last or only chance. Baca also discovered the transforming power of literacy. He regularly tours throughout the U.S. conducting writing workshops for children and adults, helps illiterate prisoners write letters to loved ones, and works with inner city students and gang members in an effort to provide some direction to their lives and help them discover their voice. He also continues to explore his own voice; through his poetry, his novels, his memoirs and screenplays, he writes of racial injustice, of drug addiction and murder, of poverty and the violence it breeds. 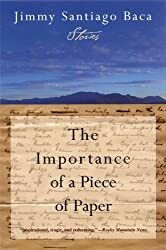 In The Importance of a Piece of Paper: Stories — his first collection of short stories published earlier this year — Baca maps the territory where Old World traditions contend with New World ambitions, and disenfranchised characters struggle to make something of themselves in the world while somehow keeping their souls intact. 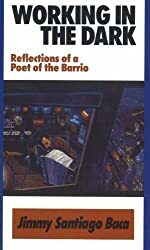 In his book Working in the Dark: Reflections of a Poet of the Barrio , he writes of being immersed in drugs and petty crime, and discovering the power of language in prison after reading Neruda and Paz. It is for all these reasons that Baca tries to break through during his visits with children or those ‘living in dark places’ in their lives. Despite the many lives he’s touched, Baca balks at being called a hero. His hero, he says, is the open heart because it is such a hard place to get to. “Anyone who has that open heart, I want to surround that person, because that person is fun, that person is compassionate, that person is real, that person is grounded,” he said. Yet Jimmy Santiago Baca has his own way of getting through to people. When he talks, they listen.